AirCover's organosilicone chemistry allows for superior wetting and absorption of herbicides into plant, leaf and stem surfaces. 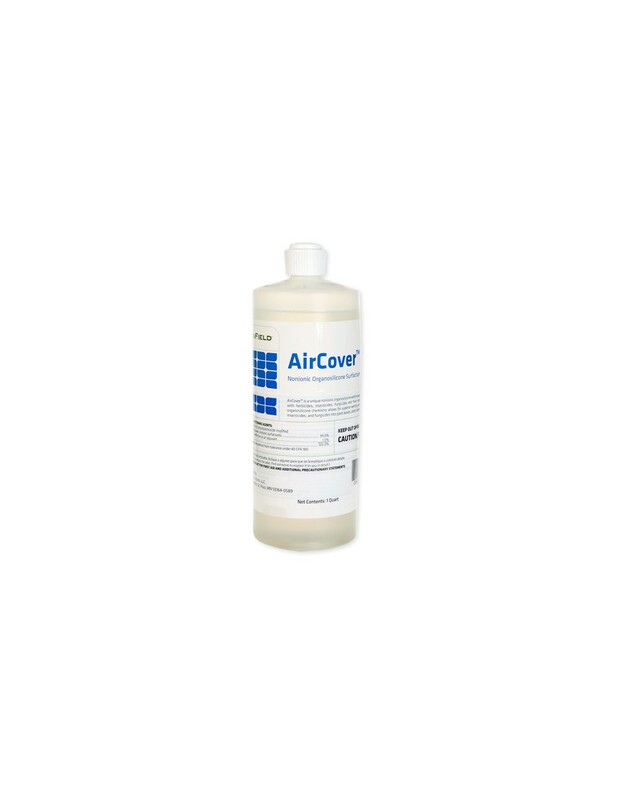 AirCover Surfactant is a unique non-ionic organosilicone surfactant wetting agent which is highly effective with post-emergent and non-selective herbicides, insecticides, fungicides and foliar-applied nutrients. Aircover's organosilicone chemistry allows for superior wetting and absorption of herbicides into plant, leaf and stem surfaces. AirCover Surfactant Uses / Applications: AirCover may be used with most pesticides and fertilizer products as directed on this label. Observe initial application to insure thorough coverage without excessive runoff of the spray. 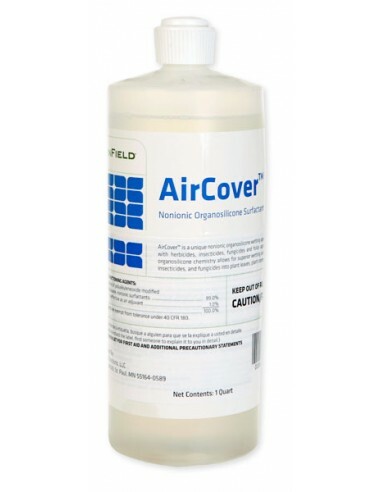 AirCover effectively improves coverage and distribution of spray droplets when applied as directed, with pesticides and/or fertilizers, to field crops, vegetable crops, tree and vine crops (fruit and nut), turf, greens and tees, ornamentals, trees and other non-crop areas. NOTE: The application rates on this label are based on pesticide labels which recommend the use of a non-ionic surfactant. Rates of this product may be increased or decreased. For optimum results, follow pesticide labeling for proper recommendations. Before using AirCover where a non-ionic surfactant may not be recommended, the user or applicator adviser must have experience with the combination or must have conducted a phytotoxicity trial. Basal Bark Treatment: AirCover will aid the penetration of insecticides, fungicides, herbicides, fertilizers, and other products through bark. Use 0.64 to 1.28 fl. oz. per gallon or 0.5 to 1% v/v. Consult pesticide labels for specific use rates based on pesticide. MIXING: Prior to pesticide application, clean mixing and application equipment according to pesticide label directions. To minimize foaming, fill spray tank 2/3 or 3/4 full of water. If foaming is anticipated an anti-foaming agent such as Fast Break should be added before pesticides, nutrients, or AirCover. Spray coverage and drift control: To optimize spray coverage or deposition, and to reduce drift, include Droplex adjuvant.